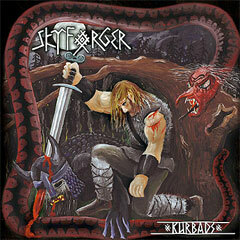 By far the most successful heavy metal band from Latvia has to be Skyforger. Last year, the band released Kurbads, its first album on the Metal Blade Records label and its sixth album overall. Besides attracting a large and dedicated following within Latvia, Skyforger has made itself known internationally. This is not too surprising. Not only does the group display accomplished musicianship and songwriting, but Skyforger also distinguishes itself by the fact that its music is influenced by Latvian folk themes and pagan traditions. Skyforger also makes use of traditional Latvian instruments. The group even dresses the part, with a wardrobe that makes band members look like ancient Latvian warriors. Due to its growth in popularity, international recording companies have taken notice. Last year, Skyforger signed with Metal Blade Records, perhaps the best known of the labels catering to heavy metal music. Kurbads, as many of Skyforger’s previous works, delves deep into Latvian folklore and presents a series of songs about the warrior Kurbads, son of the mare. To be sure, the music of Skyforger is an acquired taste. Besides it being heavy metal, which might not be to the liking of some listeners, the music is particularly aggressive. The vocals are more growled than sung, making the lyrics almost unintelligible at times. Fortunately, the booklet that comes with the compact disc includes full lyrics in Latvian with English translations. 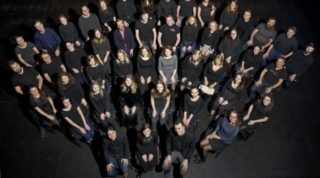 Formed in 1995, the group is just past its 15th anniversary as an ensemble. However, the CD packaging is vague about the identities of the band members. They are only listed by the first names and nicknames: there is Peter on lead vocals and guitars, Edgars “Zirgs” on bass and vocals, Kaspars playing folk instruments and singing, Edgars “Mazais” on percussion, and Martins, also on guitars. The Skyforger songs that I like the most are the ones that use traditional instruments, such as “Ķēves dēls,” which features what sounds like a Latvian stabule (reed pipe) and is about the birth of Kurbads. There is also Skyforger’s interpretation of a Latvian folksong, “Tēva dēla pagalmā,” sung in a very gruff, though slightly more intelligible, style. I actually wish there were more songs that more prominently feature Latvian instruments, or even Latvian folk song melodies. 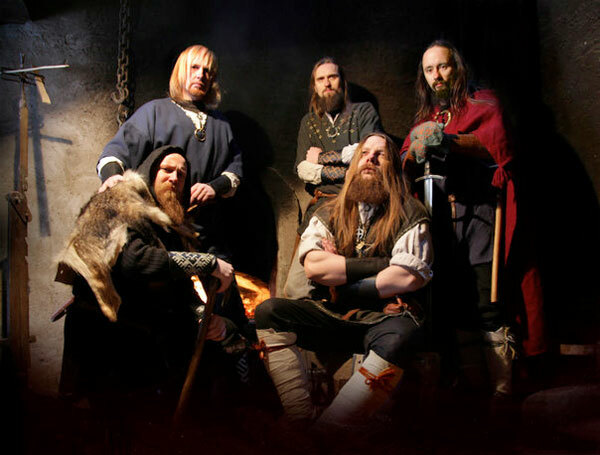 Of all of the Skyforger songs that I have heard, the one that I have liked the most is the band’s heavy metal version of the Latvian folk song, “Migla, migla, rasa, rasa,” found on Skyforger’s 2003 album, Pērkonkalve. Apart from the previously mentioned songs, and besides the lyrical content, there seems to be less of a Latvian influence in the melodies and music this time around. The songs continue the story of Kurbads, with “Deviņgalvis,” a song about Kurbads’ battle with the ogre with nine heads (after finishing off an ogre with slightly fewer heads: six); “Velnukāvējs,” the story of the forging of a mighty sword for Kurbads; and Kurbads’ own violent death in “Pēdējā kauja,” where, after slaying the Serpent Witch with one hand and a giant ogre with the other, he finally succumbs to the snake poison already in him, falls on his sword and dies. As a bonus track the album also features a cover version of the song “Kurbads,” originally recorded by Latvian hard rock band Opus Pro in 1986, though played with much heavier guitars and more aggression. To be honest, I found Kurbads to be difficult to get into. There is no denying Skyforger’s talents, as band members certainly have written some monster riffs on this record. The lyrical content is certainly unique, but something still seems missing here. The playing is tight and aggressive, but (perhaps it is my advancing age) it would still have been nice to hear a bit more singing and a bit less growling. It becomes difficult to distinguish the songs if they are all fast tempo, aggressive riffing. In any case, one must admire the band’s success, as well as its dedication to its art. Hopefully this is the album that brings Skyforger a larger worldwide following, which it certainly deserves. Note: Latvians Online receives a commission on purchases. To be honest when Latvia mentions for some reason Skyforger is the first thing comes on my min then Riga. They are really great band and deserves much better success. And with Metal Blade upcoming album and gigs on big fests like Hellfest rises the Skyforger flag higher. Hail to Baltic heroes.